Valentina Krachmalnicoff is a CNRS researcher scientist at Institut Langevin. She obtained a PhD degree from University Paris-Sud in 2009 with a thesis on quantum atom optics experiments done under the supervision of A. Aspect and C. Westbrook. 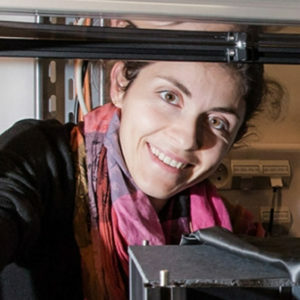 In 2010, she joined the Langevin Institute (group of Prof. R. Carminati) as a postdoctoral fellow to develop a novel nanophotonic experimental setup for studying the influence of a complex environment on spontaneous emission. In 2012, she joined the Langevin Institute as a CNRS research scientist. Her research work concerns the study of the near-field interaction between fluorescent nano-emitters with nanostructured plasmonic or dielectric samples and optical transport properties in nanostructured media. She has a strong experience in fluorescence intensity and decay rate measurements of nano-objects grafted on the tip of a scanning probe microscope, and in nano-manipulation. In 2007 she was laureate of the prize L’Oréal France-UNESCO “For Women in Science”. In 2017, she was awarded the CNRS Bronze Medal. The CNRS Bronze Medal recognizes a researcher’s first work, which makes that person a specialist with talent in a particular field.